This time around, Edward 'Megs' Morrison and the Vootball Kids are confronted with issues both on and off the pitch that make them take a good, hard look at what they like about Vootball - and resort to some unusual measures to fight for it. The Simpfenator is going off the rails. Mrs Morrison is slowly losing it. The Pennendale Wanderers are struggling for points, and the pressure of performing in the State team makes them all realise that sometimes, parents should just sit in a rocking chair, read the paper and let the kids play. 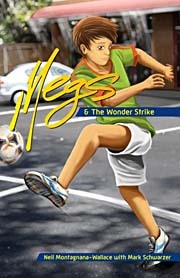 Megs and the Wonder Strike is about finding balance in life, about the different shapes and sizes of bullying, and about sticking up for what you believe in. It's about laughing at obstacles put in front of you, and finding your own fun. Maybe, it's also about you.